Before Louisiana voters trek to the polls in record low numbers on Oct. 14, there are a few things to consider about State Sen. Neil Riser, one of four candidates for the job of state treasurer, who, besides failing to help landowners being fenced out of their hunting lands, actually took campaign cash from a family member of the one erecting the fences. Riser, author of that infamous bill amendment in the waning minutes of the 2014 legislative session that would have given State Police Superintendent Mike Edmonson an additional $100,000 or so per year in retirement benefits, has received some other interesting contributions as well. The Louisiana Safety Association of Timbermen gave $2,500 to his senate re-election campaign in March 2014 and only 18 months later filed for BANKRUPTCY on behalf of its self-insurance worker’s compensation fund, leaving quite a few policy holders in the lurch. Several nursing homes have contributed $2,500 each to his treasurer campaign. The nursing home industry, heavily reliant on state payments on the basis of bed occupancy, consistently benefited from favorable legislation by the Louisiana Legislature over the past decade that discouraged home care for the elderly. But by far the biggest beneficiary of Riser’s legislative efforts is Vantage Health Plan, Inc., of Monroe which contributed $1,000 in 2015 to his Senate re-election campaign and another $1,000 to his treasurer campaign in March of this year. Vantage has received six state contracts totaling nearly $242 million during the time Riser has served in the State Senate. But it was Riser, along with Sens. Mike Walsworth of West Monroe, Rick Gallot of Ruston and Francis Thompson of Delhi, who pushed Senate Bill 216 of 2013 through the Legislature which cleared the way for the state to bypass the necessity of accepting bids for the purchase of the state-owned former Virginia Hotel and an adjoining building and parking lot. That was done expressly for the purpose of allowing Vantage to purchase the property for $881,000 despite there being a second buyer interested in purchasing the property from the state, most likely for a higher price. By law, if a legislative act is passed, the state may legally skip the public bid process to accommodate a buyer. This was done even though a Monroe couple, who had earlier purchased the nearby Penn Hotel, wanted to buy the Virginia and convert it into a boutique hotel. Thanks to Riser and the other three legislators, they were never given the opportunity. And Vantage, from all appearances, really got a bargain. The building was constructed in 1925 at a cost of $1.6 million and underwent extensive renovations in 1969 and again in 1984, according to documents provided LouisianaVoice, all of which should have made the property worth considerably more than $881,000. Read the entire story HERE. All of which raises the obvious question of why did the Jindal administration turn its back on the potential of a higher sale price through bidding, especially considering the financial condition of the state during his entire term of office? We will probably never know the answer to that. One might think that that kind of effort on its behalf would be worth more than a couple of thousand in campaign cash to Vantage. Vantage could have at least shown the same gratitude as the relative of the owner of 55,000 of fenced hunting property in Riser’s district. When landowners in Winn, Caldwell and LaSalle parishes felt they were being fenced out of their hunting rights back in 2013, they did what any citizen might do: they went to their legislator for help–in this case, Riser, who paid the obligatory lip service of expressing concern for landowners Wyndel Gough, Gary Hatten, and Michael Gough but who, in the end, did nothing to assist them. Instead, as so often happens today in politics, he sold out to the highest bidder. One the $5,000 contributors to Riser’s campaign is none other than Hunter Farms & Timber, LLC, of Lafayette. An officer in that firm is Billy Busbice, Jr., of Jackson, Wyoming. William Busbice Sr., one-time chairman of the Louisiana Wildlife and Fisheries Commission, and Junior’s father, is a partner in Six C Rentals Limited Partnership of Youngsville, LA. Which purchased and proceeded to fence in some 55,000 acres of prime hunting land a few years back. The original LouisianaVoice story on that dispute can be read HERE. All of which only serves to underscore the long-held perception that we in Louisiana, by continually electing the type of public officials who are interested only in the next big deal, get the kind of representation we deserve. Perhaps it’s time to direct some hard questions to Department of Public Safety and Corrections (DPSC) Secretary Jimmy LeBlanc. LeBlanc, after all, is technically Mike Edmonson’s boss. Besides holding the title of Superintendent of State Police, Edmonson is also Deputy Secretary of DPSC. LeBlanc only recently came through an intensive investigation into the Corrections, also under the DPSC umbrella. That investigation cost Angola Warden Burl Cain and several of his family members their jobs. She may wish to revisit that decision. Today, FBI agents fanned out across the state to simultaneously serve federal grand jury subpoenas on 18 State Troopers, LouisianaVoice has learned. Included among those served were officers and directors of that very same LSTA that DPSC refuses to investigate. One report indicated that the LSTA board of directors was in its monthly meeting Wednesday when federal agents walked in and served each board member with his subpoena. LouisianaVoice has not learned the date of the grand jury nor was the specific subject readily available. But because troopers from across the state were served, it would seem reasonable to assume that the thrust of the federal investigation is the laundering of campaign contributions by the LSTA through the association’s executive director David Young, a story LouisianaVoice broke more than a year ago. It was not immediately known if Young was one of those served on Wednesday. It was also learned that the FBI has already interviewed some of those slapped with subpoenas today. The LSTA board is comprised of trooper representatives from each of the eight state police troops. The individual troop headquarters are located in Baton Rouge in East Baton Rouge Parish, Kenner in Jefferson Parish, Mandeville in St. Tammany Parish, Lake Charles in Calcasieu Parish, Lafayette in Lafayette Parish, Monroe in Ouachita Parish, Bossier City in Bossier Parish and Gray in Terrebonne Parish. Neither Edmonson, Deputy Superintendent Lt. Col. Charles Dupuy nor Director of Management and Finance Lt. Col. Jason Starnes were among those handed subpoenas. Only LSTA officers, directors and former officers and directors were served. Regardless, reports out of State Police headquarters in Baton Rouge say command personnel have been in “full panic mode” all afternoon as they hunkered down in meetings. As my grandfather used to say, you probably couldn’t pull a needle out of their butts with a John Deere tractor. A federal grand jury subpoena, after all, is less welcome than an IRS audit letter—and who knows? That might not be far behind. LSTA general counsel Floyd Falcon cannot represent any of those served if their legal interests should conflict with those of the association, as they quite likely will. That means that each of those served will have to retain his own legal counsel. With that many having been served subpoenas, it’s likely that at least one, maybe several, will roll over and give the feds information they’re looking for in order to cut a deal. The scramble will be to see who can give up whom first because that’s will will likely get the best deal. What’s not likely is for any of them to lie because we’re sure they are all keenly aware that lying to the FBI, even if not under oath, can get a quick trip to a federal facility where one can work in the laundry for 20 cents per hour. One thing you can expect out of all of this: there will be no united front. Targets are almost certain to turn on each other as the cannibalization begins in earnest. Edmonson already has thrown the four men who drove the expedition to California—and his secretary—under the bus. And make no mistake: the clock is ticking on Gov. John Bel Edwards. Mike Edmonson, Charles Dupuy and Jason Starnes represent baggage he simply cannot afford to carry into his campaign for reelection. That campaign cranks up in less than two years. Edmonson needs to go and he needs to take LeBlanc with him. Back to you, Kathy Williams. A couple of reports, unconfirmed to this point, have been swirling about concerning the ongoing investigation into that San Diego trip taken by State Police Superintendent Mike Edmonson and 16 or so subordinates, including the four who went by state vehicle via Las Vegas and the Grand Canyon. Altogether, the jaunt cost Louisiana taxpayers more than $73,000. But there also are confirmed developments that might have raised some concern on the part of those who want to see an unbiased investigation that will lead to appropriate action on the part of Gov. John Bel Edwards. It seems, however, that initial concern has been defused. First, the unsubstantiated reports that, while lacking official confirmation, come from those close to the investigation who are considered reliable. Attorney General Jeff Landry’s office is said to have begun an investigation on its own, separate and apart from that of the governor’s office. A spokesperson for the AG said that could be neither confirmed nor denied. “Our office has a policy of not commenting on such matters so as not to compromise any investigation it may be conducting,” she said. Another well-placed source said the FBI is also conducting an investigation of Edmonson and LSP, though Edmonson earlier denied any such investigation. Our source of that story said he initially provided information to the FBI but now that the agency’s investigation is underway, he has not been involved in further dialog with agents. Conspicuously absent is any report that the Office of Inspector General, that fiercely independent investigative agency, has undertaken any effort to look into possible criminal wrongdoing at LSP. That could, of course, be because OIG isn’t as independent of the governor’s office as it likes to claim. It likewise would be reassuring if East Baton Rouge Parish District Attorney Hillar Moore initiated a grand jury investigation or at least weighed in if for no other reason than to say he was taking a wait and see approach to the governor’s investigation. After all, any crime committed in the East Baton Rouge Parish falls under his jurisdiction. 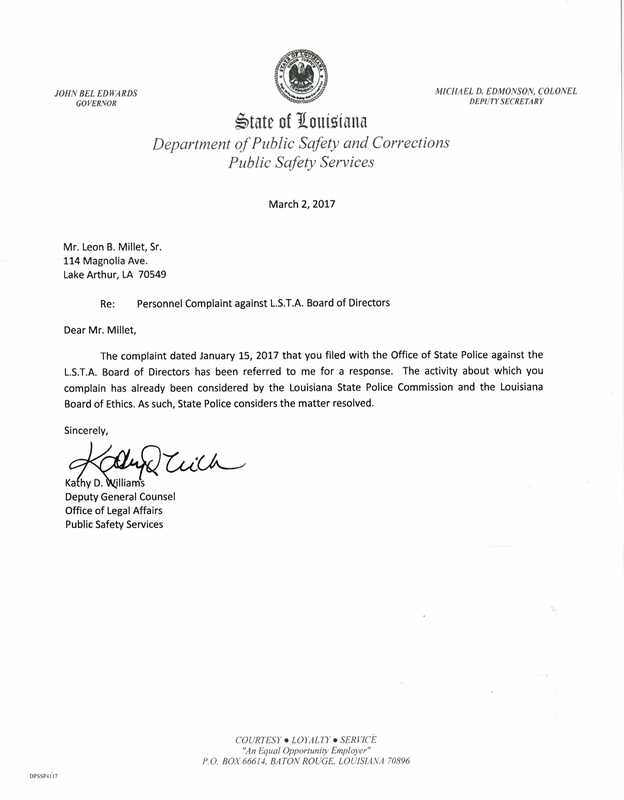 Mark Falcon did, however, assauge concerns when he offered full disclosure in informing Commissioner of Administration Jay Dardenne that he is the brother of Floyd Falcon, legal counsel for the Louisiana State Troopers Association (LSTA), the lobbying arm of LSP. It was LouisianaVoice’s story about the LSTA’s practice of laundering illegal campaign contributions through the personal bank account of its executive director David Young more than a year ago that prompted Floyd Falcon to refer to me as “a chronic complainer,” a characterization that has likely only intensified in his mind, given the manner in which the LSP saga has played out thus far. But Mark Falcon’s voluntary disclosure of his relationship with Floyd Falcon and the manner in which he presented it is encouraging and provides optimism that the DOA investigation will be complete and above-board. That is particularly important because two of those who took that trip to San Diego had their travel and lodging expenses on the trip picked up by the LSTA. Only the meals for Trooper Alexandr Nezgodinsky, a native of San Diego, and Lt. Stephen Lafargue were paid for by the state. Several others who made the trip are also LSTA members but had their expenses paid by the state. In another development, LouisianaVoice received a rather dubious response to a public records requests regarding other trips Edmonson took to receive various awards. New Orleans Convention and Visitors Bureau, Captain Katz Lifetime Award for Outstanding Achievement in Public Safety, 2015.
all travel records, including airfare, other travel, lodging, meals, registration fees and any and all other expenses incurred by all personnel (by name) who attended the New Orleans Mardi Gras festivities for the years 2008 through 2016 (exclusive of security details assigned to the event). The remaining requests are still being handling and further responses will be forthcoming. Any questions that you may have should be addressed to Major Doug Cain. “Not even for those who went with him?” I wrote back (because we know by now he rarely travels alone). So the bottom line is we are being asked to believe that Edmonson, who packed 15 of his people off to San Diego, all of whom combined to run up expenses of more than $73,000, including salaries and travel, lodging and meal expenses, either took no one with him on the other trips and he didn’t consume any meals on his trips or perhaps he took traveling companions, none of whom spent a dime of state funds. Either scenario requires a leap of faith to believe.